This week, I rolled up my sleeves, gathered the recycle bins, and started weeding through papers. At first, I was almost paralyzed with a sense of dread. I knew that a lot of what I would find would remind me of painful times. I also knew that I’d find things that I still felt attached to, even though they won’t serve me in the next seasons of my life. I thought about having to let go of dreams, memories, and unfulfilled hopes. And I grew sad when I thought about the painful trials that many of the papers represented. Medical records from past illnesses and conditions that God has healed! Several unfinished projects that I started with gusto but never finished, reflecting a pattern of quitting when detail work became overwhelming. Several to-do’s that never got done, reflecting difficulty with making decisions and establishing closure. Rejection letters from various submitted magazine articles and a book proposal, reflecting difficulty with moving on from disappointments. Extra copies of things that I kept “just in case” I might need them, reflecting a scarcity mindset. Tons of unfiled papers, reflecting difficulty with organizing backlogs. Dozens of books that I had already read, and didn’t need anymore (like books about taking care of babies! ), representing a tendency to hold on to things unnecessarily. I resolved to commit some of the defeating habits to prayer and self-coaching. 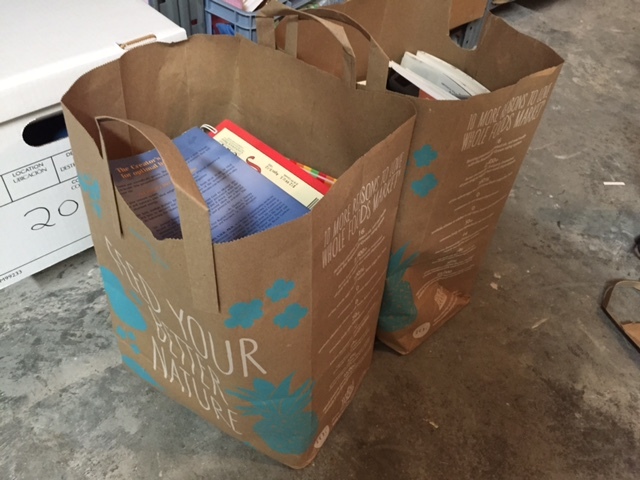 I bagged up the papers for recycling and the books for donating. I gave thanks that the purpose represented by each item had already been accomplished. And finally, I released these things, allowing myself the freedom to move forward with new hope and a clearer path. Are you ready to clear the paper clutter from your life? Pray for courage, roll up your sleeves, and just do it! Then write about your experiences in the comment section below. I’d love to share this journey with you! Reflection: “Forget the former things; do not dwell on the past. See, I am doing a new thing! Now it springs up; do you not perceive it? I am making a way in the desert and streams in the wasteland” (Isaiah 43:18-19). Journal: Is paper clutter accumulating in your life? If so, are you ready clear it out? Journal about any feelings of hesitation, any new insights you discover, and what you experience after the clutter is gone.